For over 34 years Dr. Rosen has been teaching chiropractic technique to thousands of chiropractors and chiropractic students worldwide. Over the past 18 years much of his focus has been on the pediatric population. This Complete Pediatric Library is a culmination of his years of clinical experience and research. As one of the foremost pediatric chiropractors Dr. Rosen is offering a unique opportunity to any chiropractor or chiropractic student who understands the importance of pediatric chiropractic care and wants to master the art and science of pediatric chiropractic spinal and cranial evaluation and adjusting protocols. This 20-disc set and comprehensive book is truly one of the most thorough, inspirational and clinically valuable chiropractic pediatric programs available today. In our newest DVD set (3 DVDs plus a 4th PDF workbook CD) - Intra-oral Adjusting Protocols for the Adult and Pediatric Patient - you will learn the art of intra-oral cranial adjusting. These techniques are some of the most specific and effective ways to make cranial corrections. Intra-oral corrective protocols will often succeed when extra-oral corrections are not making the desired changes. 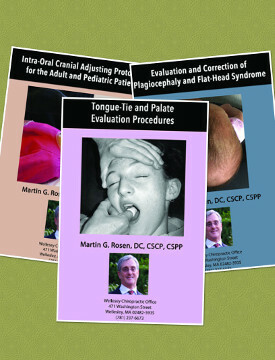 The Tongue-tie and Palate Evaluation Procedures DVD (workbook PDF on second disc) discusses the issue of tongue-tie (ankyloglossia) as it is becoming more common in the pediatric population. Dr. Rosen discusses the protocols necessary to evaluate tongue-tie and what effect the different grades of tongue-tie have on the developing child. He also covers the different approaches to correction of the tongue-tie, when surgical intervention is necessary, and when more conservative procedures are appropriate. The correction procedures and protocols for evaluating the palate and its relationship to cranial mechanics and tongue-tie are also covered. Determining proper palate anatomy and physiology is crucial to evaluating the proper function of the entire cranium. Understanding palatal mechanics and anatomy allows the practitioner to determine how the cranial sutural and dural meningeal system is working. The effect of the palatine and maxillary bones on cranial bone growth, functional issues (i.e. nursing, feeding and speech) and the neurological development of the child are of paramount importance. This 8-disc bundle set is a valuable tool to improve your clinical outcomes and grow your practice. 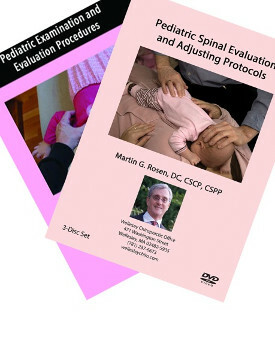 The protocols demonstrated on these DVDs will allow you to address some of the most common issues in the pediatric practice with more confidence and clinical skill. The art of intra-oral cranial adjusting are some of the most specific and effective ways to make cranial corrections. Intra-oral corrective protocols will often succeed when extra-oral corrections are not making the desired changes. The clinical evaluation and corrective protocols for Plagiocephaly, Brachycephaly, Scaphlocephaly and Flat-head syndrome are discussed as well as both extrinsic and intrinsic causes, the variations, and the treatment protocols for these cranial distortions. The issue of tongue-tie (ankyloglossia) is becoming more common in the pediatric population. To address this issue, Dr. Rosen discusses the protocols necessary to evaluate tongue-tie and what effect the different grades of tongue-tie have on the developing child. He also covers the different approaches to correction of the tongue-tie, when surgical intervention is necessary, and when more conservative procedures are appropriate. The effect of the palatine and maxillary bones on cranial bone growth, functional issues (i.e. nursing, feeding and speech) and the neurological development of the child are of paramount importance. Correction protocols for specific palate distortions are demonstrated as well as how these distortions affect the rest of the cranium. A PDF workbook for each topic is included on a separate disc. The best care for your Pediatric Patients, starts with a complete chiropractic examination. In these DVDs you will learn a comprehensive Pediatric Examination for newborns all the way to pre-teen. Our Pediatric Spinal Adjusting DVDs will give you full spinal adjusting protocols for both structural and tonal adjustments. The global affects of cranial distortions, especially cranial nerve involvement (i.e. Vagus nerve), is well documented. Balancing the autonomic nervous system, processing, behavioral, emotional issues, visual, balance and coordination can all be affected by aberrant cranial mechanics. These two DVDs will help the practitioner address many of the more challenging cases common to the chiropractic office. Increasing your skill in correcting cranial imbalances will not only increase your effectiveness in working with your patients but make you a greater referral source for other health care practitioners. Growing your practice by increasing your skill and positive patient outcomes is a much more consistent, congruent, time honored and long-term effective methodology then constantly applying new "marketing" strategies to maintain practice growth and development. 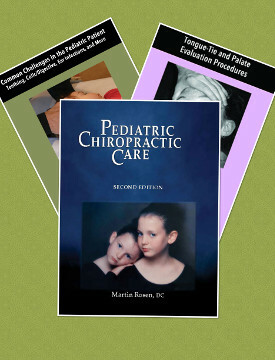 The 2nd Edition of Dr Martin Rosen's book: "Pediatric Chiropractic Care" has completely revised Chapter 3, now called The Pediatric Exam, to give the practitioner a more concise step-by-step approach to evaluating the pediatric spine and nervous system. We have also added several charts, a more detailed index and improved explanations of spinal and cranial evaluation and adjusting protocols. The issue of Tongue-tie is becoming more common in the pediatric population. In this 2 disc, Dr Rosen discusses the protocols necessary to evaluate tongue-tie and what effect the different grades have on the developing child. You will learn how to evaluate the palate and its relationship to cranial mechanics and tongue-tie. Correction protocols are also demonstrated. In the 3-disc set of Common Challenges in the Pediatric Patient you will learn specific techniques to assist in controlling neurological responses present in acute situations such as ear infections, teething, colic/digestive challenges and more. 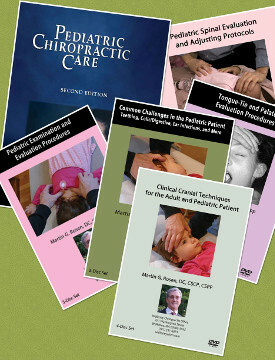 This newly revised Pediatric Care Library includes our just release 2nd Edition of our book: "Pediatric Chiropractic Care". We have completely revised Chapter 3, now called The Pediatric Exam, to give the practitioner a more concise step-by-step approach to evaluating the pediatric spine and nervous system. We have also added several charts, a more detailed index and improved explanations of spinal and cranial evaluation and adjusting protocols. Each DVD title includes a PDF workbook on a CD. If brought separately this set would cost $700 with shipping. 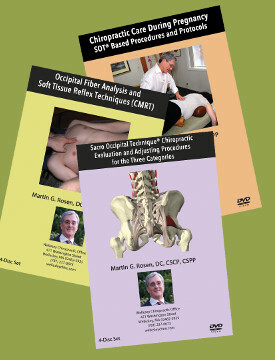 In this SOT® Technique Bundle you will learn the procedures for evaluating your patient to determine the proper Category as well as the complete adjusting protocols for Category I, II and III with our 4 DVD set on SacroOccipital Technique. In addition learn the specific adjusting protocols necessary to address the hyper-mobility and pelvic balance issues specific to the pregnant patients with the 3 DVD set on Chiropractic Care During Pregnancy. Learn the skills necessary to deal with the changing neurophysiological and biomechanical presentations of the pregnant patient and help with even the most challenging cases. In the 3-DVD set on Occipital Fiber Analysis and CMRT, you will learn to locate, evaluate and neutralize the Occipital Fiber Indicators for vasomotor and viscerosomatic subluxations and to determine the major spinal imbalance that is affecting the patient’s dural meningeal and autonomic nervous system. You will learn to corrective procedures for Occipital Line I and Line 2 as well as the supportive soft tissue procedures for the major organ systems including: lung and sinuses, stomach, gall bladder, ICV, pancreas, cecum, liver, spleen and immune system and more. Sold separately, these DVDs would cost $565 with shipping. This DVD special offer incorporates a multi-faceted approach to cranial corrections. They focus on both pediatric growth and development issues and challenges as well as adult cranial dysfunctions. Learn to evaluate and correct the palate, cranial specific subluxation patterns and TMJ function as well as vagus nerve involvement. These techniques can help you work with children and adults with a myriad of issues including: nursing, reflux, digestive challenges, sympathetic dominant conditions, speech challenges, processing issues and abnormal cranial growth patterns (flat-head syndrome, plagiocephaly, cone-head appearance, sutural jamming etc). 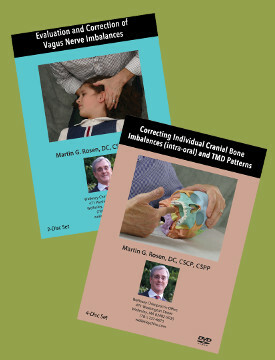 Each DVD set explains the evaluation, implications and correction of some of the most common aberrant cranial presentations. This information will add a new dimension to your practice and patient care protocols. If you want to become competent in cranial evaluating and adjusting, this DVD package (8 discs in all including PDF workbooks) provides the groundwork to move towards the level of expertise you and your patients deserve. If you want to move your practice to the next level of clinical competency this DVD bundle will be an invaluable tool. 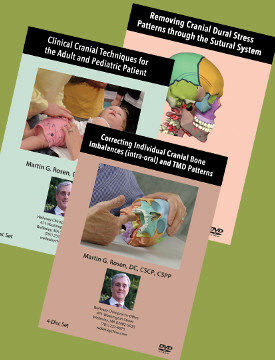 In this 12 disc set (including 3 PDF disc workbooks and 9 DVDs) you will learn specific cranial adjusting protocols for a variety of adult and pediatric presentations. Included are techniques to evaluate and correct the cranial sutural system, specific cranial bone subluxation patterns, cerebrospinal fluid mechanics, the cranial dural meningeal system, TMD issues as well as specific symptomatic presentations.